Don’t let a curveball interview question catch you off guard. Interviews are already nerve-wracking. I don’t know anyone who enjoys feeling like they are under a microscope, being scrutinized or interrogated. So what can you do to feel confident and empowered during your upcoming job interview? 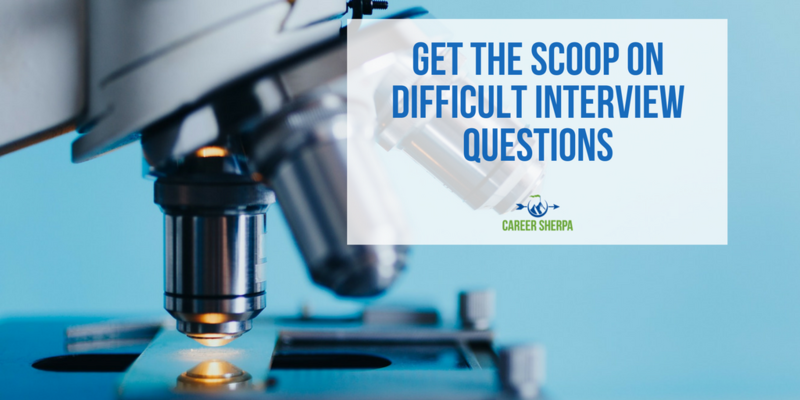 Learn the types of questions you can anticipate and how the interview process works. Some industries are known to conduct more difficult interviews. If you are interviewing with a hospital, nonprofit or school, expect a tougher interview, but if interviewing for a contract or “gig economy” job, you can expect a less challenging interview, according to Glassdoor’s Economic Research division. And it isn’t only the industry that determines tough interviews. Large companies typically run candidates through tougher interviews. The same Glassdoor research found interviews at larger companies are statistically more difficult than at small employers. Many job types appear in Glassdoor’s 27 Jobs With Unbelievably Tough Interview Questions. You’ll discover that almost any role is subject to challenging interview questions, from customer service representative to a nonprofit donor family advocate. Here are just some of the most difficult questions listed by Glassdoor, including the role and employer. “How do you explain a vending machine to someone who hasn’t seen or used one before?” – Global Data Analyst, Bloomberg L.P. In most instances, the interviewer wants to understand your thought process or logic for reaching an answer. The good news is, there really isn’t a right or wrong answer to these types of interview questions. For example, if asked “What type of breakfast cereal would you be and why?” your answer will show your self-awareness, personality and style. If your answer aligns with the employer’s expectations, you’re in luck. It’s never a good idea to bluff your answer to fit with the company or role. In the long run, this could lead to a mismatch and you could end up hating the job. The best way to prepare for your upcoming job interview is to practice all your answers out loud. When you just practice in your head, it doesn’t have the same effect. Also speak to people you know who may be able to offer insight on the company’s interview process, people you will be meeting or give you the inside scoop on what the job really entails. It is easy to get derailed if you haven’t prepared for your interview. And preparing means more than printing your resume and picking the right outfit. You need to know what to expect before you walk into the job interview so be sure to ask questions when scheduling the interview. Find out who you will be meeting with, how long the interview will last and if you’ll need to bring anything other than your resume. Also, ask what the format of the interview will be. In other words, will it be a panel interview or will you only be speaking with human resources? And in case you hadn’t heard, employers are making candidates jump through more hoops, such as delivering a presentation or taking a skills test. The more you know about the process, the fewer surprises there will be. Consider the hiring process as a way of matching candidates with employers. Job interviews offer a way to evaluate candidates who are a good fit and this leads to employees who are more productive and have greater satisfaction with their job and company. It’s a win-win. Just make sure you ask your own smart interview questions.